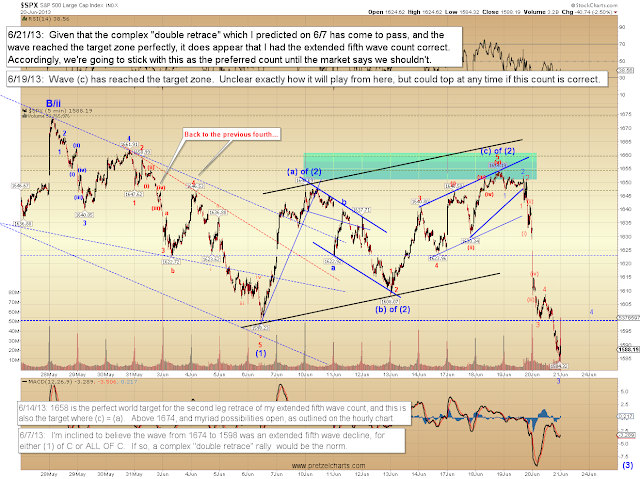 The market finally broke the 1598 low, which I've been slightly favoring would be the intermediate outcome for this wave. In fact, while the last wave felt very whippy, it appears I had the preferred count dead right all along. Below is the "best guess" market path I published on June 12, and this is one of the reasons I love Elliott Wave theory. When properly applied, there is simply no other system that matches it. 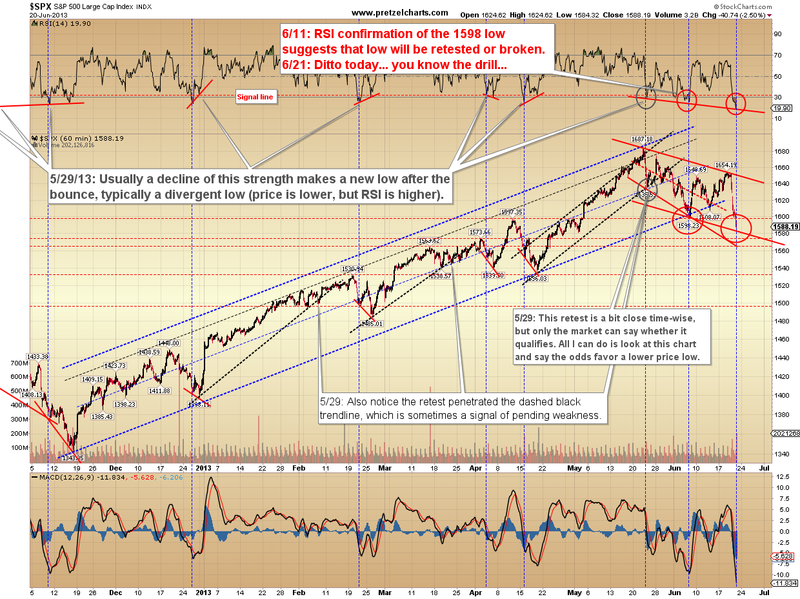 We can see on the current chart that the market couldn't have followed this projection much better than it did. Now we hold our collective breath and see if T3 is reached. 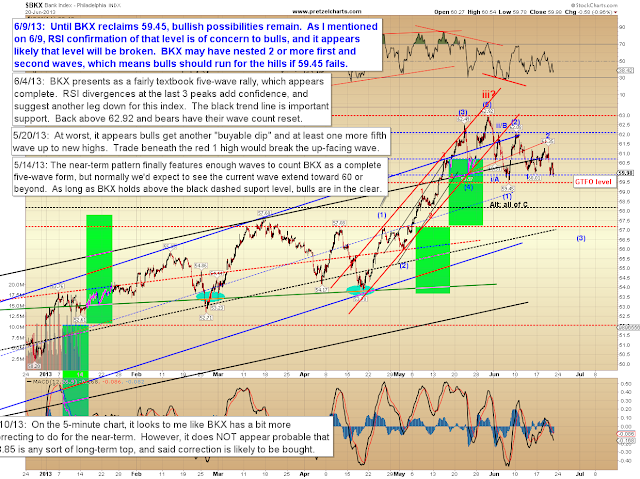 Again, please keep in mind that if this count is correct at intermediate degree, this is a nested third wave decline. Third waves can be tricky, because the smaller waves are usually compressed, which means bounces should be muted. During third waves, I usually stay short (or long) until I start seeing impulsive moves to the upside (or downside) -- I've found that otherwise I often cover way too soon and the market runs away from me. Draw your trend lines and use those as guides. 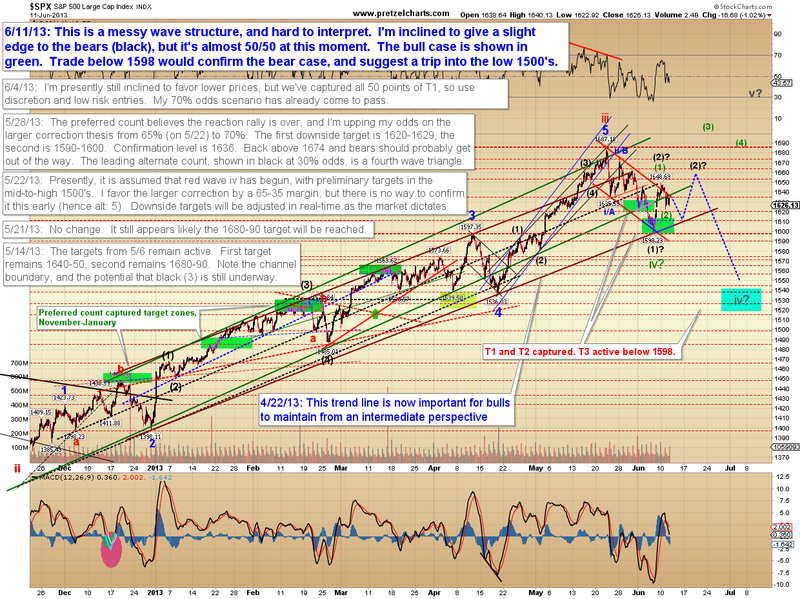 Keep in mind that the idea of a third wave decline is to punish the dip buyers. It punishes them by not letting them out and not giving them any bounces to allow them to get back to even on. It will keep punishing them until they stop and go curl up in a corner... or until they decide to go short -- then it bounces. 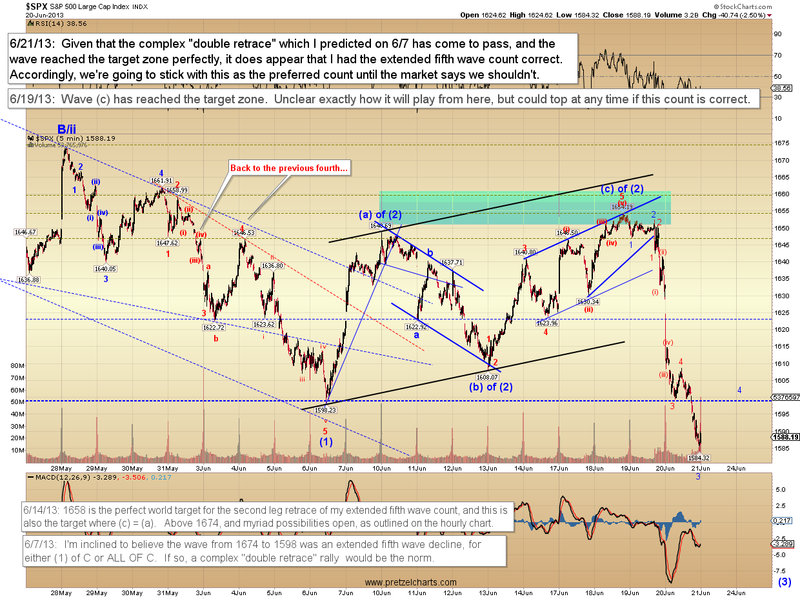 This doesn't mean bears should get complacent, and there is an alternate count which could find a bottom directly -- but I wouldn't suggest front running anything during a third wave. 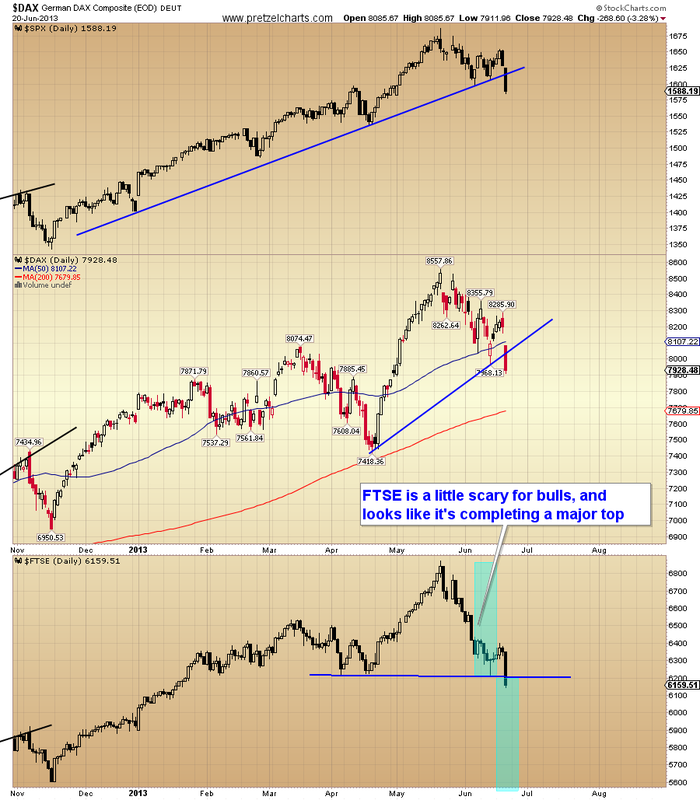 Until there are signs of a turn, this is a dangerous market for dip buying. 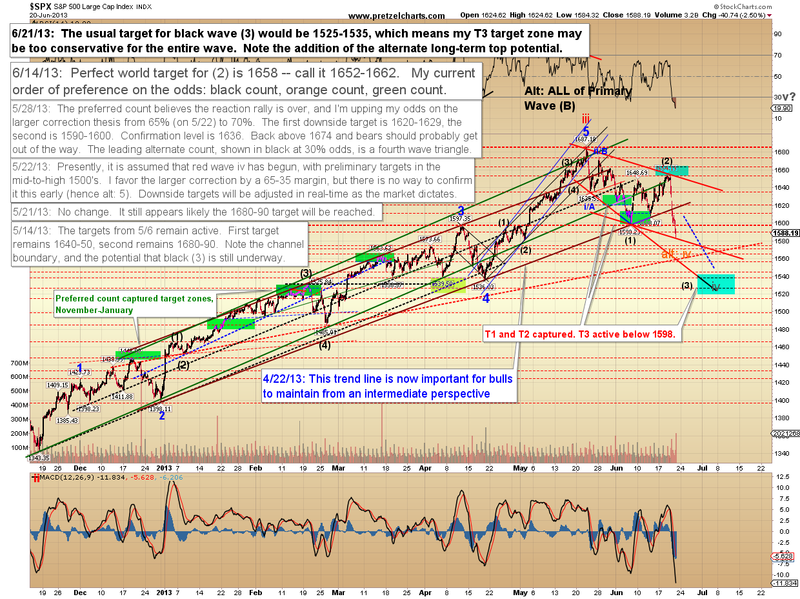 If my preferred intermediate wave count continues to track, we now have to give a bit more credence to the idea that 1687 may mark a long-term top. 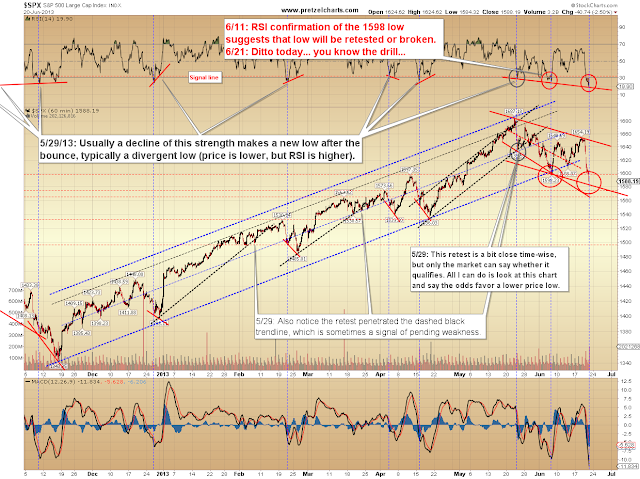 I last published the count shown below back in May, and I'm still considering it a marginal underdog -- however, if the current decline continues to play out as expected, then this more bearish count may gain additional traction. 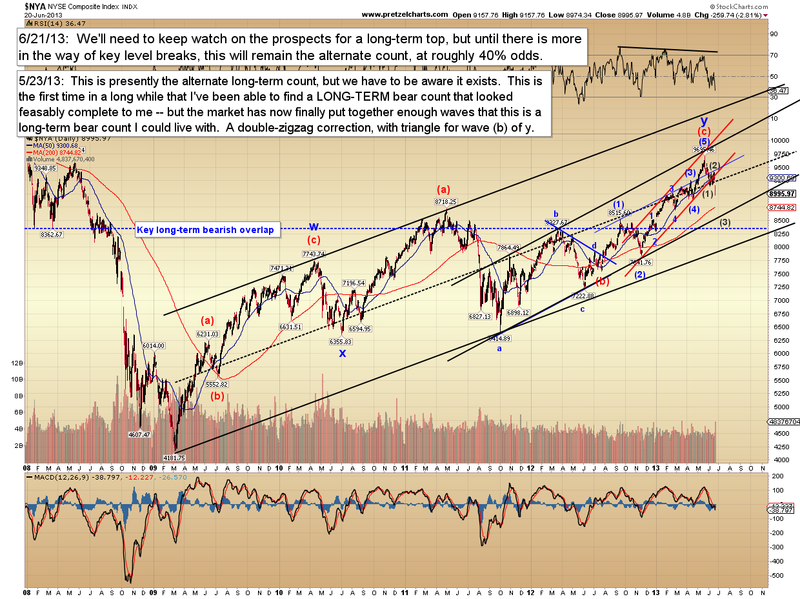 The long-term expectations for this wave count would be new lows beneath the 2009 low. One chart that bothers me ever so slightly for the bears is the Philadelphia Bank Index (BKX), which failed to make a new low yesterday. Keep an eye on this one. In conclusion, I continue to feel that lower prices await. 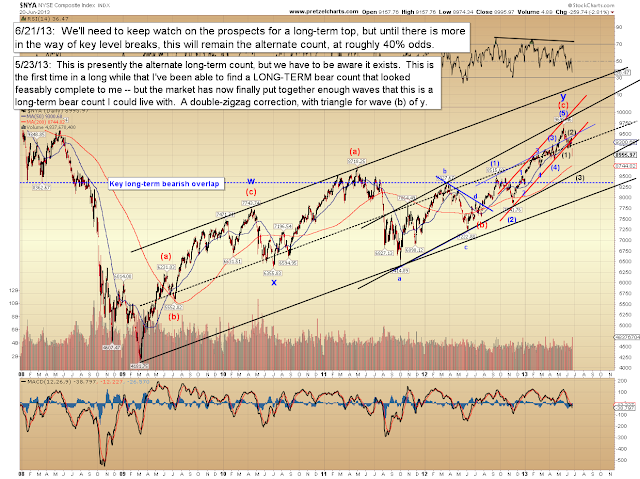 Long-term, I think bulls still have the edge, but if this wave count plays out as expected, there may be problems lurking. We'll keep an eye on this heading forward. Trade safe.